For our twenty-second installment let's take a look the most common MANPADS, or Surface-to-Air Missiles, in the War in Afghanistan. The HN-5 (Hong Ying-5 "Red Tassel") is a family of first generation Chinese man-portable air-defense systems (MANPAD) based on Soviet technology. The literal translation of Hong Ying is Red Tassel, but HN abbreviation is used to avoid confusion with HY (Hai Ying, or Sea Eagle) series anti-ship missiles of Silkworm missile family. The HN-5 series in Chinese hands has been phased out in front-line and first line reserve units by QW series MANPAD, but still being used by militia units. The HN-5 is a reverse-engineered version of the Soviet Strela 2 (SA-7). Due to the urgent need for MANPADs, North Vietnam provided China with an original sample during the Vietnam War and asked China to produce and supply NVA with copies. However, due to the political turmoil in China, namely, the Cultural Revolution, the reverse-engineering process was slow and by the time the first small production batch was sent to Vietnam for evaluation, the results were ineffective because American aircraft has already adopted ECM to successfully counter HN-5 and its Soviet counterpart the Strela 2. The dimensions and performance of HN-5 is extremely similar to that of Strela 2. The Shorts Blowpipe is a man-portable surface-to-air missile that was in use with the British Army and Royal Marines from 1975. It was superseded by an interim design, Javelin, and later the greatly improved Starstreak. The missile is shipped as a single round in a storage cylinder/firing tube. The aiming unit is clipped to the launch tube and fired from the operator's shoulder. To reduce the overall size of the container, the rear fins of the missile are stored in the larger diameter cylinder at the front of the tube (this also contains the Yagi antenna for transmitting guidance signals); during firing, the fins slip onto the rear of the missile as it flies through and are held there by heat-activated adhesive tapes. This gives the launch container a unique shape, seemingly oversized at the front and extremely thin at the rear. The missile is powered by a short duration solid rocket for launch, then by a sustainer motor once it is well clear of the launch tube. 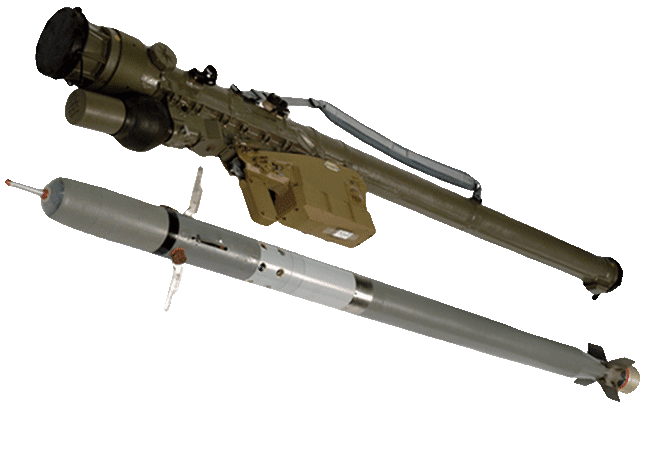 The Blowpipe's guidance is initially semi-automatic with the missile gathered to the centre of the sight's crosshairs by the infrared optic atop the aiming unit. Two to three seconds after launch, missile guidance is switched to fully MCLOS mode, and the operator regains full control of the missile. The operator has to steer the missile all the way to its target manually via a small thumb joystick. The operator can opt not to use autogathering when engaging low flying targets such as helicopters, but then has to super-elevate the launcher to ensure that the missile does not hit the ground. Four flares in the tail of the missile make it visible in flight, first to the infrared optic, then to the operator. 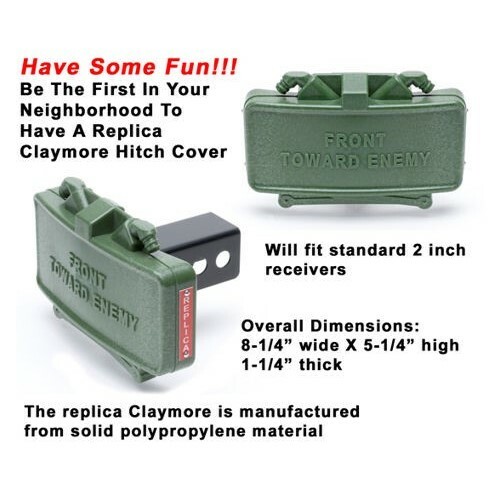 Detonation is either by proximity or contact fuse. In emergencies, the operator can end an engagement by shutting off the power to the transmitter with the system switch, after which the missile will immediately self-destruct. The aiming unit can then be removed from the empty missile container and fitted to a new round. Blowpipe was developed as a SAM for submarines, fitted as a cluster of four missiles into a mast that could be raised from the submarine's conning tower under the name Submarine Launched Airflight Missile (SLAM) trialled on HMS Aeneas (P427) in 1972. These were for a time installed on Israeli Gal class submarines. Blowpipe was used by both sides during the Falklands War in 1982. With the targets being fast flying aircraft, flying low and using the ground to hide their approach, the Blowpipe operator had about 20 seconds to spot the target, align the unit and fire. Brigadier Julian Thompson compared using the weapon to "trying to shoot pheasants with a drainpipe". The official report stated that, of the 95 missiles fired by the British, only 9 managed to destroy their targets and all of these were slow flying planes and helicopters. A later report determined that only two kills could be attributed to Blowpipe: A British Harrier GR3 (XZ972) attacked by Argentine Army special forces (Commandos Company), and an Argentine Aermacchi MB-339 (0766 (4-A-114)) during the Battle of Goose Green. Blowpipe was found to be particularly ineffective when used to engage a crossing target or to chase a target moving rapidly away from the operator. The poor performance led to it being withdrawn from UK service. In 1986 some of the mothballed units were sent clandestinely to equip the Mujahideen fighting the Soviets in Afghanistan. The system again proved ineffective, and was eventually supplanted by the US Stinger missile. While Blowpipe was available on the international arms market and therefore its origins were open to speculation, the Stinger was restricted, which at the time indicated a more open acknowledgment of Western support for the Mujahideen. 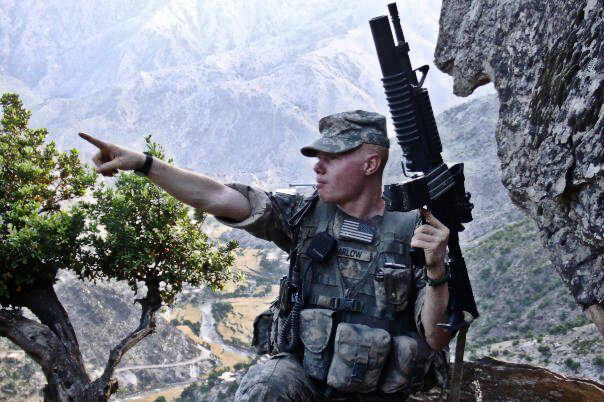 Blowpipe missile systems are still being found in weapon caches as recently as May 2012 in Afghanistan. 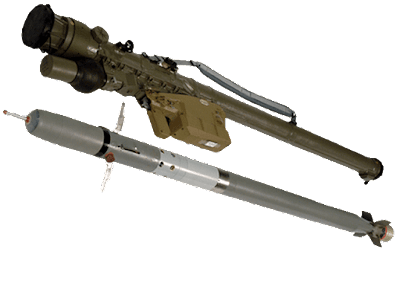 The Canadian military took Blowpipe from storage to give some protection to their naval contribution to the 1991 Gulf war, although sheer age had degraded the weapons, and nine out of 27 missiles tested misfired in some way. The Javelin GL, which was backward compatible to the Blowpipe, was then hastily purchased as a replacement. The 9K38 Igla is a Russian/Soviet man-portable infrared homing surface-to-air missile (SAM). "9K38" is the Russian GRAU designation of the system. Its US DoD designation is SA-18 and its NATO reporting name is Grouse; a simplified, earlier version is known as the 9K310 Igla-1, or SA-16 Gimlet. The development of the Igla short-range man-portable air defense system (MANPADS) began in the Kolomna OKB in 1972. Contrary to what is commonly reported, the Igla is not an improved version of the earlier Strela family (Strela-2 and Strela-3), but an all new project. The main goals were to create a missile with better resistance to countermeasures and wider engagement envelope than the earlier Strela series MANPADS systems. Technical difficulties in the development quickly made it obvious that the development would take far longer than anticipated, however, and in 1978 the program split in two: while the development of the full-capability Igla would continue, a simplified version (Igla-1) with a simpler IR seeker based on that of the earlier Strela-3 would be developed to enter service earlier than the full-capability version could be finished. The 9K310 Igla-1 system and its 9M313 missile were accepted into service in the Soviet army on 11 March 1981. 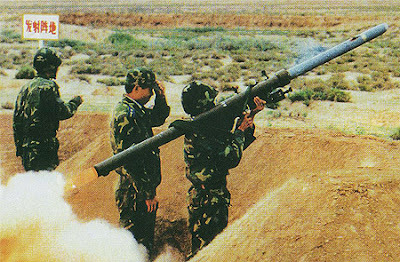 The main differences from the Strela-3 included an optional Identification Friend or Foe system to prevent firing on friendly aircraft, an automatic lead and super elevation to simplify shooting and reduce minimum firing range, a slightly larger rocket, reduced drag and better guidance system extend maximum range and improve performance against fast and maneuverable targets, an improved lethality on target achieved by a combination of delayed impact fuzing, terminal maneuver to hit the fuselage rather than jet nozzle, an additional charge to set off the remaining rocket fuel (if any) on impact, an improved resistance to infrared countermeasures (both decoy flares and ALQ-144 series jamming emitters), and slightly improved seeker sensitivity. The seeker has two detectors – a cooled MWIR InSb detector for detection of the target and uncooled PbS SWIR detector for detection of IR decoys (flares). The built-in logic determines whether the detected object is a target or a decoy. The latest version (Igla-S) is reported to have additional detectors around the main seeker to provide further resistance against pulsed IRCM devices commonly used on helicopters. The 9M313 missile features an aerospike mounted on a tripod (Igla's 9M39 missile has aerospike attached directly to the seeker dome), which reduces a shock wave, thus providing less dome heating and greater range. The name Igla is derived from these devices. 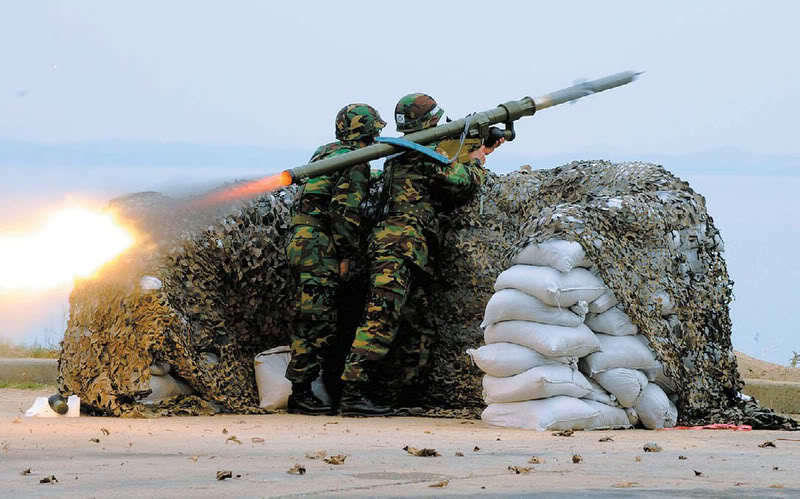 Like many other MANPADS, Igla-1 and Igla feature so-called rolling airframe missiles. These missiles roll in flight (900 – 1200 rpm) so steering the missile requires just a single pair of control surfaces, unlike roll-stabilized missiles, which require separate control surfaces for pitch and yaw. Both 9M313 and 9M39 missiles contain a gas generator, which drives a small gas turbine to provide electrical power, and the pistons, which move the canards used to steer the missile in a bang-bang mode. In addition to that, two exhaust tubes of the gas generator are placed perpendicular to the steering canards to provide maneuverability immediately after launch when the missile airspeed is too low for canards to be effective. Later versions of Igla are reported to use proportional control to drive the canards, which enables greater precision and less oscillation of the flight path. According to the manufacturer, South African tests have shown the Igla's superiority over the contemporary (1982 service entry) but smaller and lighter American FIM-92A Stinger missile. According to Kolomna OKB, the Igla-1 has a Pk (probability of kill) of 0.30 to 0.48 against unprotected targets which is reduced to 0.24 in the presence of decoy flares and jamming. In another report, the manufacturer claimed a Pk of 0.59 against an approaching and 0.44 against receding F-4 Phantom II fighter not employing infrared countermeasures or evasive maneuvers. The full-capability 9K38 Igla with its 9M39 missile was finally accepted into service in the Soviet Army in 1983. The main improvements over the Igla-1 included much improved resistance against flares and jamming, a more sensitive seeker, expanding forward-hemisphere engagement capability to include straight-approaching fighters (all-aspect capability) under favourable circumstances, a slightly longer range, a higher-impulse, shorter-burning rocket with higher peak velocity (but approximately same time of flight to maximum range). The naval variant of 9K38 Igla has the NATO reporting name SA-N-10 Grouse. The Igla–1M missile consists of a Ground Power Supply Source (GPSS), Launching Tube, Launching Mechanism & Missile (9M 313–1).